Jake Allen, Professional Goaltender for the St. Louis Blues NHL), visited the Blackville School on Friday, May 22. Allen had taken the time out of his fishing vacation to sign autographs for every student (grades 3-12) in the school. Photographs were provided for all students and Allen signed nearly 400 pictures. Allen is originally from Fredericton and spends his off-season there. Allen's father, Kurt, is a member of the New Brunswick Interscholastic Athletic Association (NBIAA) Executive Committee with Blackville School Principal Mr. Buggie. He arranged his son's visit as a favour for Mr. Buggie. For more photos of Allen's visit, click here. Middle School students celebrated their last dance of the year on Thursday evening May 21. This was the students' spring dance. The grade eight students will be having their banquet on June 11 and their end of year trip on June 16. For more photos from the dance, click here. Blackville School will be presenting the annual Choir and Band Spring Concert on Tuesday, May 26, 2015 at 7:00 p.m. in the school cafeteria. This concert will feature performances by the two school choirs, the Blackville School Jazz Band along with the Grade 9U band class, and some vocal soloists. Admission is $5.00 for adults and $2.00 for students. Beverages, fudge and tickets on a 50/50 draw will be sold during the concert. Middle school and high school students from Blackville School attended the Provincial Drama Festival in Fredericton during the week of May 4. The Middle School Drama Club presented "The Happiness Shop," the High School Drama Club presented "Cinderella and The Substitute Fairy Godmother" and the High School Theatre Arts 120 class presented "Crushed". All three groups did an outstanding job and received great praise from the adjudicators. "Cinderella and The Substitute Fairy Godmother"
The 2015 Yearbooks recently arrived at Blackville School. Although many of them were pre-ordered, there are still copies available for purchase at the school office. The price is forty-five dollars. The 2015 yearbook is a 72 page full colour book and captures many special moments throughout the school year, including drama, sports, winter carnival, and other activities at the elementary, middle, and high school levels. What's Cooking at Blackville School? A seven week after school cooking program is being offered to students at Blackville School as an extracurricular activity. The program is designed to help teach high school students about healthy eating, meal preparation, food safety and budgeting. Students will be better prepared when they are out on their own and have to cook their own meals. “It’s a really fun and good program,” said Grade 11 student Kolby Harris. “It’s a good experience, and you get to learn lots of new and interesting things, ” he added. The group meets every Wednesday night in the Home Ec room where they stay for about two and a half to three hours. They have snacks, play games, participate in discussions and even get to cook a new recipe each week. Each student also gets a copy of the recipe. This is their third week into the program, and so far it has been well received. Dr. Tiffany Keenan and NBCC-Miramichi students Jenna Colford and Marcey Jardine are coordinating the program as part of the Community and School Wellness Initiative. The program is open to grade 10-12 students. The current student had to fill out a multiple choice questionnaire about their eating and cooking lifestyle and fill out a registration form. The program is only designed for 12-14 students, so if interest grows there may be an application letter that will need to be written if students are interested in joining next year. There is also some discussion on recognizing the extra-curricular activity as a credit for graduation. This cooking program is a highly entertaining and educational way of teaching students how to fend for themselves without the need to head out for fast food. In only three weeks the students have learned about food safety, healthy eating, how to cook in bulk, and how long to leave food in the fridge. Registration forms will be made available to students who are interested in the next school year's program. For more photos from the program, click here. everything she does. She has been a great leader and fundraiser for the upcoming Gr8 trip! Her hard work does not go unnoticed. Keep it up, Courtney! Chloe is an especially kind and helpful student who is thoughtful and shows leadership skills. 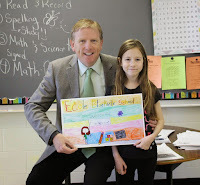 Chloe shows outstanding effort in anything she does and is a hard working student. showing outstanding effort in everything she does. improvement and outstanding effort in his studies. Patrick shows great leadership skills and works hard during class. He always tries his best and does very well in school. The Blackville High School Student Council will be hosting a Ford Drive 4UR School Event this Saturday, May 16. Community members are invited to come in for a test drive in one of the new Ford vehicles. If you want to get a head start on things, you can sign up online by clicking here. Just bring the pin number you receive after signing up to the school on Saturday. The Student Council urges people to attend the event. If more people sign up and test drive a vehicle, more money is earned for the school. The school can earn up to $6000.00 if enough people come out and test drive a vehicle. student Julia Green and her welcome sign. 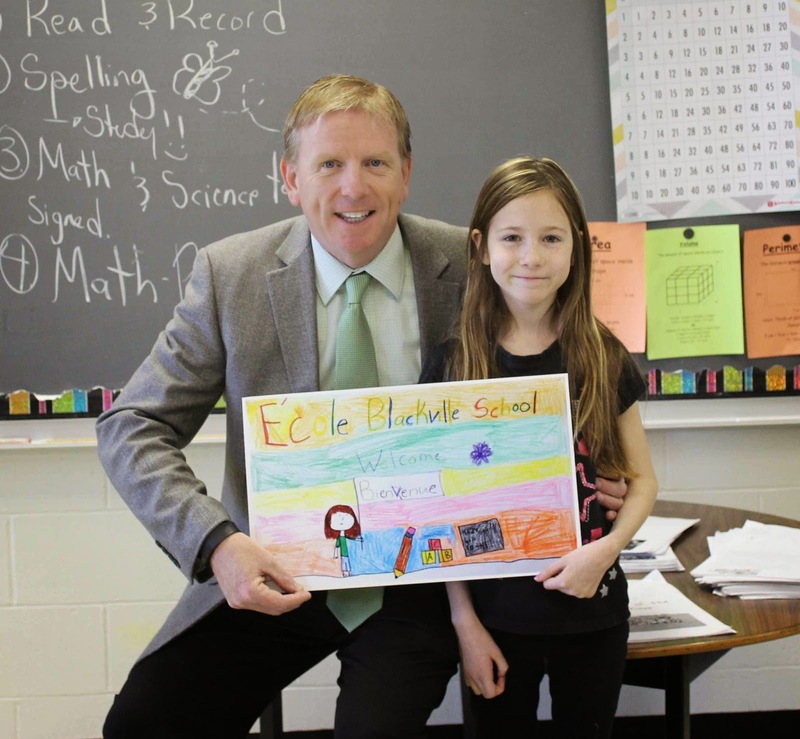 Grade 5 students at Blackville School had a competition to see who could create the best welcome sign in French. Julia Green's poster was blown up into a big sign and will be posted outside the office area to welcome students, staff and visitors. Karen White-O'Connell from NBCC-Miramichi presented the High School Drama club and Theatres Arts Class 120 with a cheque for $250.00 from the NBCC-Miramichi Community Fund program. Blackville students have benefited from this fund before by receiving new uniforms for the sports teams. Both the Theatre Arts class and the High School Drama Club presented their plays at the Provincial Drama Festival in Fredericton last Thursday, May 07.